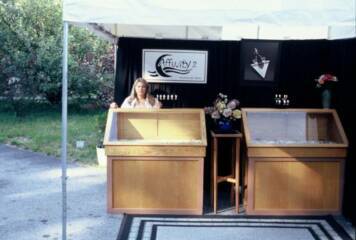 Marlene has been designing and fabricating jewelry for twenty one years. Before this she practiced as a Licensed Respiratory Therapist at local hospitals and home care for fourteen years. Deciding to change her career, she investigated and researched the art of jewelry making hoping to use her creative side. Growing up close to the ocean has taught her to value and respect Maine's natural resources and wildlife. This has influenced and inspired her designs. Always being intrigued by the arts and crafts field, Marlene decided to pursue her interest further. Self-taught, Marlene began to create a successful line of paper and fabric jewelry and accessories. Still not feeling completely fulfilled, she enrolled in numerous courses and workshops in the jewelry field. The workshop that inspired her most towards working with metals are the sessions at Haystack Mountain School of Crafts, on Deer Isle, Maine. Her current work reflects this knowledge and inspiration. Working on one-of-a-kind pieces is what she enjoys the most. Her metal work consists of gold, silver, copper, and brass. In fabricating her metal jewelry, Marlene may incorporate one or more of the following techniques; piercing, chasing, hammering, reticulation, sand-blasting, form folding, anticlastic raising, Kuem-Boo, embossing, stamping, over-lay, acid-etch and setting a precious or semi-precious stone. Marlene also has a line of hand-made Japanese Rice Paper Jewelry which is created by painting, embossing, cutting and shaping. 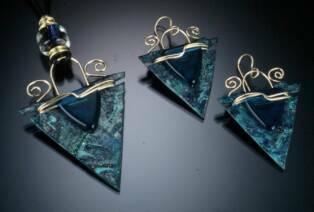 Each piece is individual and my be complimented with wire work and hand-blown art glass beads. Marlene sells her work predominantly at Fine Arts and Crafts shows in New England and Florida.